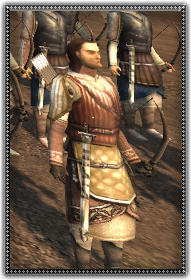 Differing from light archers, these soldiers have had previous experience with archery and do receive additional training. They are good, land-owning men and followers of Allah and his prophet who regularly pray in a mosque. Showing respect for their faithfulness, the ruling master of these lands has allowed these men to purchase armor and possibly be granted early retirement from the army. Can harass and frustrate approaching infantry.